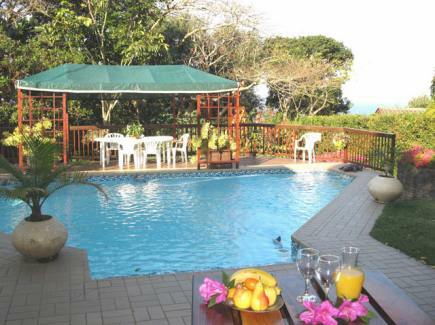 Situated in Umtentweni, a natural garden suburb nestling on the shores of the Indian Ocean, Mdoni House Guest Lodge is just 2km from Port Shepstone or the beach and within minutes of the hype of most South Coast attractions making the B&B ideal accommodation for business and leisure travellers. An oasis of peace and tranquility amongst tall trees in a large subtropical garden Mdoni House Guest Lodge was designed for the hot KZN summers, with high ceilings and airy rooms making the use of ceiling fans almost unnecessary. Your en-suite bedroom which has vibrant upholstery and stunning metal bedroom suites is also equipped with luxury “Cloud 9” mattresses, television, hospitality tray and a fridge. The charming TV lounge and bar opens on to a patio where breakfast is served, freshly cooked to your order. 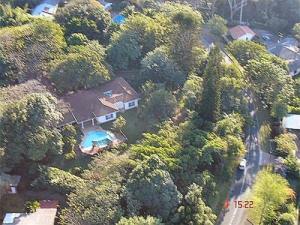 The view from here is across the sparkling blue swimming pool, through the tree tops to the ocean. There is plenty of secure shady parking for your car, boat or trailer right next to the house. 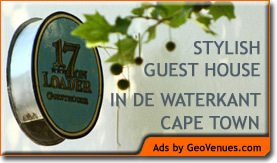 Whether assisting with office facilities or wi-fi, braai equipment, laundry, evening meals, packed breakfast for an early start or booking your transport or tours your hosts Jean and Carl offer a combination of professionalism and homeliness that will make you want to return.